Go back in time to a bygone civilization, the ancient world of Phoenicia. And play the game that originated among the Phoenician merchants - Columns. It's incredibly captivating. You'll find yourself losing track of time. Yet it's very simple. You don't have to be a game whiz to play at the hardest level. --From the Genesis Columns instruction manual. Columns is one of the three games that put not only the Genesis, but Sega on the map. 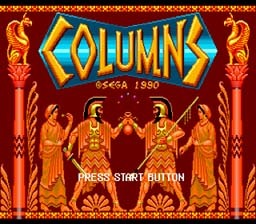 Columns was one of the biggest games to fight off Tetris and if you play you'll know why. It's is just as addictive and very brightly colored, with something other than just blocks! The feel of the game is wonderful, setting times back to Greek and Roman, with the touch of jewels. It makes you feel like a god as you control the jewels. Sliding your bright colored pieces across the screen is easy and at high speeds, can be mesmerizing. The colors just make it beautiful to look at. The music keeps you in pace with the game, it speeds up in danger, and when your level increases. Just as in Tetris, Columns allows a choice of music, all with the Greek and Roman feel as well. It keeps you wrapped with the game. Thankfully in Columns there are tons of bonuses, especially for eliminating several rows of jewels at one time. Their are also special jewels that knock out all of the jewels it touches and and other jewels on the screen that match them. This can be a big help when your stack is getting to the top, and can boost your score a great deal. The addition of Doubles play and Flash Columns, is warmly welcomed and keeps the game from going stale too fast. With so many varying levels and faster and faster game play, you'll never want to stop. I barely want to stop to write this review, I am addicted to this Columns world. I give Columns a 10 out of 10! In a new form of Tetris, this puzzler's objective is to clear jewels by placing them three or more in a row, which can be horizontal, vertical or diagonal. Choose from three methods of play, Arcade, Original, or Flash. You can also pick one, two, or co-op players. In Flash, the flashing jewels must be removed. In the other two forms you must keep your Columns low enough, so they do not go off the screen or you lose. As the game continues, the speed will increase and jewels become even more scarce. Keep up with the speed and increasing difficulty, and defeat your opponent! On the more difficult levels, don't let the fast-falling jewels scare you. Follow them carefully and play it smart. If you get too nervous, you'll lose focus and the game!